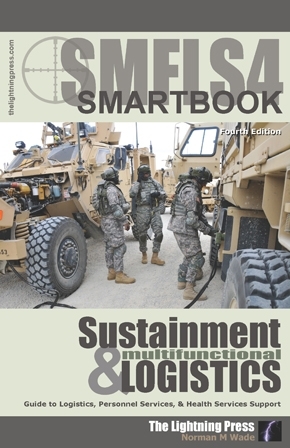 Announcing the fourth revised edition of The Sustainment & Multifunctional Logistics SMARTbook. At 360 pages it’s completely updated with more than 20 of the latest Army and Joint sustainment references, plus it features our new “lay-flat” binding with spine! In addition to the most current versions of ADP/ADRP 4-0 Sustainment (Jul ‘12), SMFLS4 incorporates the full scope of new material from ATP 4-94 Theater Sustainment Command (Jun ‘13), ATP 4-93 Sustainment Brigade (Aug ‘13), ATP 4-90 Brigade Support Battalion (Aug ‘14), Sustainment Planning, JP 4-0 Joint Logistics (Oct ‘13), ATP 3-35 Army Deployment and Redeployment (Mar ‘15), and more than a dozen new/updated Army sustainment references to include ATP 4-33, ATP 4-42, ATP 4-16, ATP 4-0.1, ATP 4-34.40, ATP 4-92, FM 1-0, FM 1-04, FM 1-05, FM 1-06, FM 4-01, FM 4-02, and FM 4-30! Download a free PDF sample and learn more at: SMFLS4: The Sustainment & Multifunctional Logistics SMARTbook, 4th Ed. (Guide to Logistics, Personnel Services & Health Services Support).